Nobody exudes coolness under pressure quite like the venerable local TV anchors who deliver the region's most important news from a teleprompter to our ears each day, and with a dash of charm to boot. But apparently if there's one thing that can send these pillars of composure into a tizzy, it's unplanned visits from area wildlife. 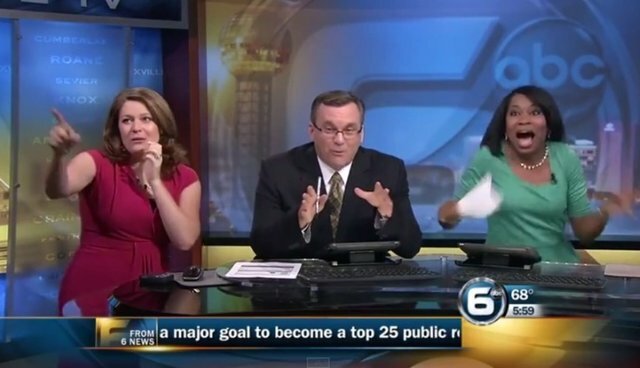 A morning broadcast on station WATE in Knoxville, Tenn. descended into sheer pandemonium on Wednesday after a bat, which had somehow gotten on set, began flying around the studio while the anchors were live on the air. The news team tried their best to maintain control of the situation, but the winged mammal was relentless. "Out of nowhere the bat comes about this far from my face. It dive bombed us and you could literally hear me screaming because we're on TV and I get that and it's a newscast, but I was gone!" WATE reports that the bat eluded capture for several hours, but was eventually captured and released by a private animal removal company. For folks in similar situations dealing with bats inside their homes, the Humane Society recommends cordoning off the animal and opening doors and windows so it can escape on its own. If that doesn't work, wear thick work gloves and try to catch the bat when it lands. Since some bats carry rabies, it is important to contact Centers For Disease Control in the event that someone gets bitten.